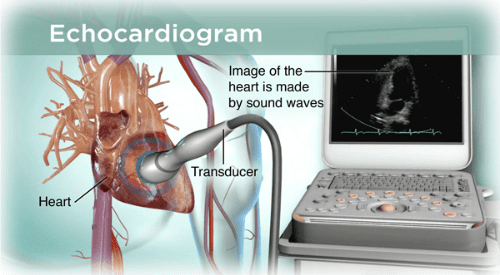 A full two-dimensional, color and pulsed Doppler transthoracic (through the chest wall) cardiac ultrasound with full digital analysis. Calculation of all four (4) cardiac chamber sizes, complete analysis of the Mitral, Aortic, Tri-cuspid, and Pulmonary valves. Calculation of the left ventricular ejection fraction, detection of any wall motion abnormalities, and complete evaluation of diastolic function (when the heart pauses before contracting.) Includes 12 lead electrocardiogram and complete analysis by an experienced physician.